The Disaster Relief Ministry allows Florida Baptist to act immediately and effectively as Jesus did to help people. When people are hurting because of a disaster, we respond with love, healing, and help. We assist all people in crisis regardless of ethnic background or religious beliefs. We do not ask the survivors for financial support. We are following the example of Jesus when He fed 5,000 and 4,000 and when he stopped to help just one person in need. Disaster Relief is Christian Love in action, meeting urgent needs of hurting humanity in crisis situations. Jesus often used teaching sessions to heal or healing to teach. When He sent the twelve disciples, He instructed them to teach and to heal, giving first priority to teaching. However, when He sent forth the seventy, He instructed them to heal then to teach. The mission of Florida Baptist Disaster Relief and Recovery Ministries is to “Make a difference” in times of disaster by connecting Florida Baptist Churches and Associations to people and communities impacted by disaster and by responding with Help, Healing, and Hope, that demonstrates and shares the love of Christ. Partnership Oriented: We seek to be a valuable partner, building strong biblical relationships that empowers volunteers to serve communities affected by disaster with passion, integrity, professionalism, and credibility. Fluid in Practice: Whatever it takes, we are His hands and feet. FLDR is known both nationally and internationally as being able to make whatever adjustments are necessary to accomplish the ministry task at hand. This is a direct result of volunteers putting others first and following the direction of our leadership team(s). Effective in Action: We continually seek to empower leaders, volunteers and partners through training, mentoring, accountability, and structure; enabling them to use their skills, talents, abilities and resources to be effective followers of Christ ministering to those affected by disaster. Local Church Focused: It is our goal to maintain a strategic and intentional partnership with local churches to support, reinforce, and encourage their ministry of making disciples of Jesus Christ and growing the Kingdom of God. Personal Information Form: It is important that you fill out a new PIF each time you attend training as well as each time you arrive on scene responding to a disaster. Southern Baptist Disaster Relief (SBC DR) is a network of state convention disaster ministries that work together in large disasters. 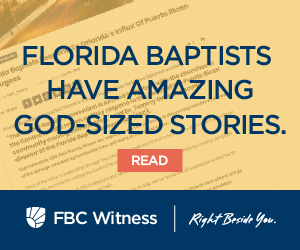 Founded in 1967 SBC DR has become one of the largest disaster volunteer organizations in the U.S.
Florida Baptist Disaster Relief (FLDR) was begun in 1982 by the Florida Baptist Convention’s Brotherhood Department. In 2006 Disaster Relief & Recovery became a stand alone department responsible for all training, activation, and operational coordination of the ministry of Florida Baptist Churches.